MainAll NewsForeign AffairsBrazilian evangelists - Israel's next great ally? Brazilian evangelists - Israel's next great ally? IFCJ launches a new campaign to raise Israel support among growing evangelical community in Brazil, which is world's largest following US. The International Fellowship of Christians and Jews (IFCJ) has long sought to foster understanding between Jews and Christians in North America, and now in a new campaign it is looking south to Brazil's growing evangelical Christian population. 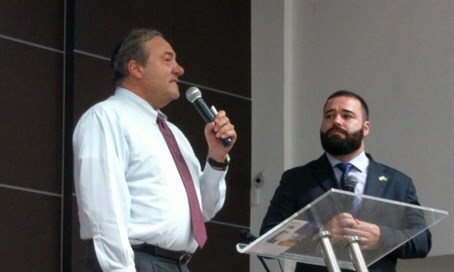 IFCJ founder and president Rabbi Yechiel Eckstein is currently in the middle of a two-week trip to a number of mega-churches throughout Brazil, in an effort to create new support for Israel and Jewish issues. Rabbi Eckstein's Brazilian tour seeks to raise awareness about IFCJ's work in aiding economically challenged Jews, helping Jews make Aliyah to Israel, and protecting Jewish institutions at risk from Muslim terrorism, among other things. The rabbi spoke to churches ranging from 1,000 to 5,000 members in size, which are part of Brazil's growing evangelical community that constitutes 22% of the country's Christian population of almost 50 million people. Brazil has the second largest evangelical community in the world behind the US. Each church Rabbi Eckstein speaks at has ancillary churches which, through social media, reach millions across the South American state with the IFCJ founder's message. IFCJ seeks to create Christian alliances worldwide to fight anti-Semitism and the BDS movement - now the group has launched an office in Brazil to expand its outreach. Rabbi Eckstein's trip, which started on May 26 and ends on June 7, includes the following churches: The Way of the Trees Baptist Church in Salvador, Bahia; the Baptist Church of Jardim Sao Paulo and the Assembly of God Victory in Christ Recife, in Recife, Pernambuco; the Getsemani Baptist Church in Belo Horizonte, Minas Gerais; the Calvary Evangelical Church and Light of Life Church in Brusque, the Assembly of God More of Christ in Florianopolis, and the Embassy of the Kingdom of God Church in Balneario Camboriu, all in Santa Catarina. He has been given a warm welcome - at Way of the Tree Baptist Church members sang "How Great Is Our God" in Hebrew and gave him a standing ovation. Meanwhile at the Baptist Church of Jardim, a group of pastors surrounded the rabbi and prayed for forgiveness for the centuries of Christian persecution committed against Jews, causing many of the church members to break into tears. “It’s been an amazing and humbling experience to speak with many thousands of Brazilian Christians about Israel, and to underscore our belief that those who bless Israel will in turn be blessed,” Rabbi Eckstein said.